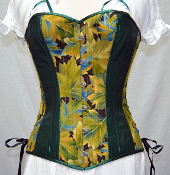 Welcome to Hearts Delight Clothiers. 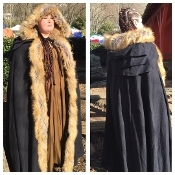 Full length Viking Cloak is lined with embossed satin and trimmed with the fur of a Mythical Creature. It has a full hood and tie closure. Available in black or burgandy with natural fur. This Underbust Corset is made of Purple silk with an overlay of black and silver metallic lace. With the steel busk in front and back lacing features you are sure to look and feel every bit as magnificent as the queen herself. Also available in Red/ Gold.